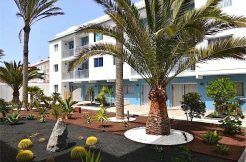 For sale Front pool apartment in Oasis Tamarindo Corralejo, beautiful set at top floor (first line from community pool). It comes of: living room, fully equipped kitchenette, one bedroom, one bathroom, private terrace. Oasis Tamarindo is located only 1 km from the town centre that features many shopping and entertainment venues. Public transport departs from a stop located 150 m away that can easily be reached on foot. The nearest beach is 1.5 km away. In the outdoor complex is a saltwater swimming pool, a children’s pool, sun loungers, parasols. There is a tennis court available for use.